The recipe makes use of two calls to the flickr api: one to get the a list of photos in a particular set, the second, repeatedly made call, to grab details down for each photo in the set. 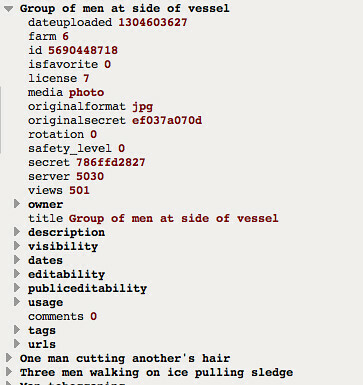 The API returns a JSON object containing separate items identifying each photo in the set. Finally, the Loop block runs through each item in the original set, calls the flickr API using the detailURI to get the details for the corresponding photo, and replaces each item with the full details of each photo. An obvious next step might be to enrich the phot decriptions with semantic tags using something like the Reuters OpenCalais service. On a quick demo, this didn’t seem to work in the pipes context (I wonder if there is Calais API throttling going on, or maybe a timeout?) but I’ve previously posted a recipe using Python that shows how to call the Open Calais service in a Python context: Augmenting OU/BBC Co-Pro Programme Data With Semantic Tags. We could then index the description, title, and semantic tags for each photo and use them to support search and linking between items in the set. Other pivots potentially arise from identifying whether photos are members of other sets, and using the metadata associated with those other sets to support discovery, as well as information contained within comments associate with each photo. The feed previews in Google Reader okay – http://www.google.com/reader/atom/feed/http://usesthis.com/feed/?r=n&n=150 – and is also viewable in my browser, but neither Google Spreadsheets (via the =importFeed() formula) nor YQL (?!) appear to like it. Once in the spreadsheet it’s easy enough to just pull out e.g. the description text from each feed item because it all appears in a single column. 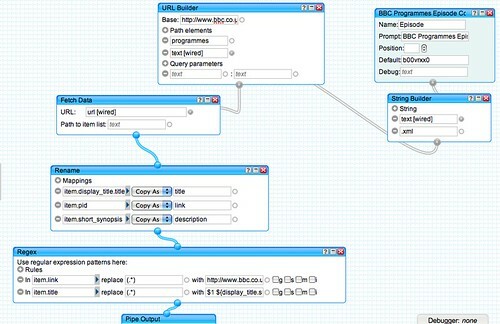 YQL then provides XML or JSON output as required. When exploring twitter based activity around an event, Guardian journalist Paul Lewis raised the question “how does a journalist know which sources are to be trusted?” (a source verification problem), identifying this as one area where tool innovation may be able to help the journalist assessing which twitter sources around an event may be worth following or contacting directly. The SocioGeo map begins to address this concern, and represents an initial attempt at mapping the social and geographical spread of tweets around an event in near real time. In its first incarnation, SocioGeoMap is intended to support visual analysis of the social and spatial distribution of people tweeting about an event in order to identify the extent to which people tweeting about an event are co-located with it/and or each other (initially, based on a sampling of geocoded tweets, although this might extend to reconciliation of identities from Twitter into location based checkin services such as Foursquare, or derived location services such as uploaded geocoded photos to Flickr), and the extent to which they know each other (initially, this is limited to whether or not they are following each other on Twitter, but could be extended to other social networks). In his presentation at the #mojo London event, Guardian interactive designer Alastair Dant suggested a fruitful approach for hacks/hackers communities might be to identify publication “archetypes” such as maps and timelines, as well as “standard content types” such as map+timeline combinations. To these, we might add the “social network” archetype, and geo-social maps (locating nodes in space and drawing social connections between them), socio-temporal maps (showing how social connections ebb and flow over time, or how messages are passed between actors) or geo-socio-temporal maps (where we plot how messages move across spatially and socially distributed nodes over time. If the simple geo-social map depiction demonstrated above does turn out to be useful, informative or instructive, the next phase might be to start using mathematical analyses of the geographical concentration of people tweeting about an event, as well as social network analysis metrics to start assigning certainty factors to individuals relating to the degree of confidence we might have that they were eyewitness to an event, embedded within it/central to it or a secondary/amplifying source only, and so on. A wider social network analysis (eg of the social networks of people associated with an event) might also provide information related to the authority/trustedness/reputations of the source in other contexts. These certainty factors might then be able to rank tweets associated with an event, or identify sources who might be worth contacting directly, or ignoring altogether. 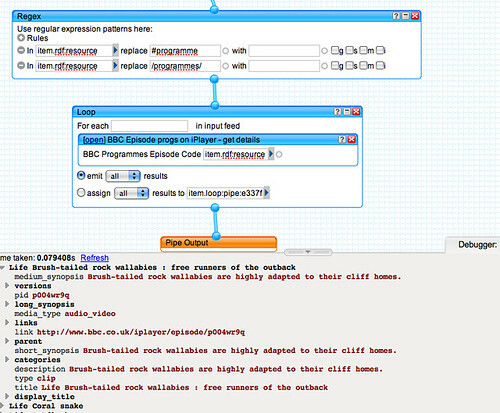 (That is, the analyses might be able to contribute to automatic filter configuration). that people tweeting about an event may or may not know each other. a significant number of people co-located with the event (and eyewitnesses to it); small clusters of these people may be tightly interconnected and follow each other (for example, social groups who visit matches together), some clusters that are weakly associated with each other via a common node (for example, different follower groups of the same team following the same football players), large numbers of people/clusters that are independent). SocioGeoMap helps visualise the extent to which twitter activity around an event is either distributed or localised in both social/social network and geographical spaces. In its envisioned next generation form, SocioGeoMap will display people tweeting about a particular topic by location (i.e. on a map) and also draw connections between them to demonstrate the extent to which they are socially connected (on Twitter, at least). SocioGeoMap as currently presented is based on particular, user submitted search queries that may also have a geographical scope. 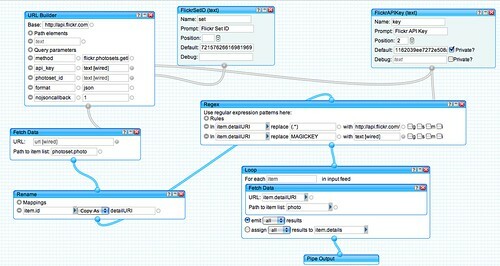 An extention of SocioGeoMap might be to create SocioGeoMap alerting dashboards around particular event types, using techniques similar to the techniques employed in many sentiment analysis tools, specifically the filtering of items through word lists containing terms that are meaningful in terms of sentiment. The twist in news terms is to identify meaningful terms that potentially relate to newsworthy exclamations (“Just heard a loud explosion”, “goal!!! !”, “feel an earthquake?” and so on), and rather than associating positive or negative sentiment around a term brand, trying to discover tweets associated with sentiments of shock or concern in a particular geographical location. SocioGeoMap may also be used in associsation with other services that support the pre-qualification or pre-verification of individuals, or certainty measure estimates on their expertise or likelihood of being in a particular place at a particular time. So for example, in the first case we might imagine doing some prequalification work around people likely to attend a planned event, such as a demonstration, based on their public declarations (“Off to #bigDemo tomorrow”), or identify their remote support/interest in it (“gutted not to be going to #bigDemo tomorrow”). Another example might include looking for geolocated evidence that an individual is a frequenter of a particular space, for example through a geo-coded analysis of their personal twitter stream and potentially also at one remove, such as through a geocoded analysis of their friends’ profiles and tweetstream, and as a result derive a certainty measure about the association of an individual with a particular location; that is, we could start to assign certainty measure to the likelihood of their being an eyewitness to an event in a particular locale based on previous geo-excursions. The demo was built out of a couple of pre-existing tools/components: a geo-based Twitter search constructed using Yahoo Pipes (Discovering Co-location Communities – Twitter Maps of Tweets Near Wherever…); and a map of social network connections between folk recently using a particular search term or hashtag (Using Protovis to Visualise Connections Between People Tweeting a Particular Term). It is possible to grab a KML URL from the geotwitter pipe and feed it into a Google map that can be embedded in a page using an iframe. 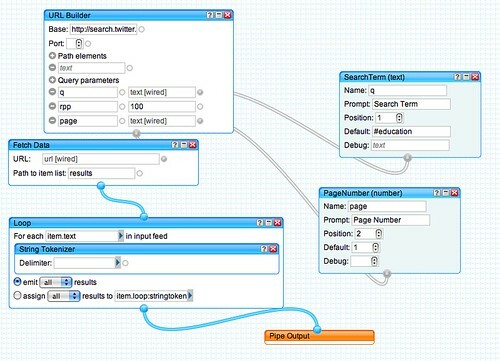 The social connections graph can also be embedded in an iframe. The SocialGeoMap page is a page that contains two iframes, one that loads the map, and a second that loads the social network graph. The same data pulled from the Yahoo geo-search pipe feeds both visualisations. Whilst this does mean that no points are plotted with their exact original co-ordinates, it does mean that we can separate out most of the markers corresponding to tweets with the same latitude and longitude and thus see them independently on the map at their approximate location. A next step in development might to move away from using Yahoo pipes, (which incur a cacheing overhead) and use server side service. A quickstart solution to this might be to generate a Python equivalent of the current pipework using Greg Gaughan’s pipe2py compiler, that generates a Python code equivalent of a Yahoo pipe. I’m working on a new pattern using Google Refine as the hub for a data fusion experiment pulling together data from different sources. I’m not sure how it’ll play out in the end, but here are some fragments…. 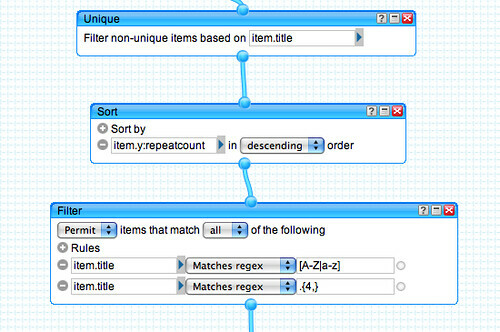 Firstly, getting data into Google Refine… I had hoped to be able to pull a subset of data from a Google Spreadsheet into Google Refine by importing CSV data obtained from the spreadsheet via a query generated using my Google Spreadsheet/Guardian datastore explorer (see Using Google Spreadsheets as a Database with the Google Visualisation API Query Language for more on this) but it seems that Refine would rather pull the whole of the spreadsheet in (or at least, the whole of the first sheet (I think?!)). Here’s the interface to the pipe – it requires the Google spreadsheet public key id, the sheet id, and the query… The data I’m using is a spreadsheet maintained by the Guardian datastore containing UK university fees data (spreadsheet. Now we process the JSON response to generate some meaningful data columns (for more on how to do this, see Tech Tips: Making Sense of JSON Strings – Follow the Structure). Then parse the JSON to extract the data field required in the new column. – we parse the JSON to give us a couple of new columns. And there we have it – a clunky, but workable, route for merging data from two different Google spreadsheets using Google Refine. – find all the OU/BBC co-produced programmes that are currently available on iPlayer. Rather than (or maybe as well as?) dumping all the programme data into a single Linked Data triple store, the data is exposed via programme pages on the BBC website. 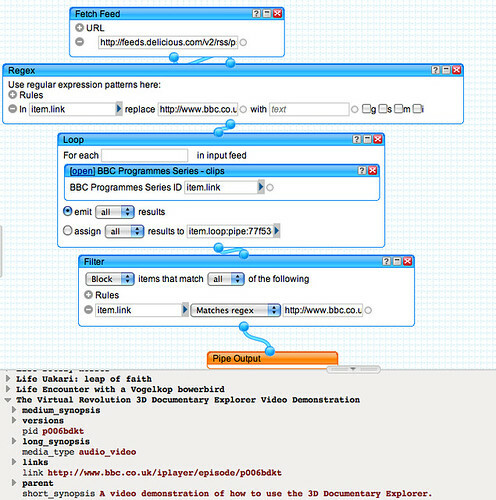 As well as HTML versions of each programme pages (that is, pages for each series, each episode in a series, each clip from a programme), the BBC also publish RDF and XML views over the data represented in each page. This machine readable data is all linked, so for example, a series page includes well defined links to the programme pages for each episode included in that series. So for example, to get the XML version of the series page http://www.bbc.co.uk/programmes/b006mvlc add the suffix .xml to give http://www.bbc.co.uk/programmes/b006mvlc.xml. Again, the .xml suffix can be used to get the xml version of the page. 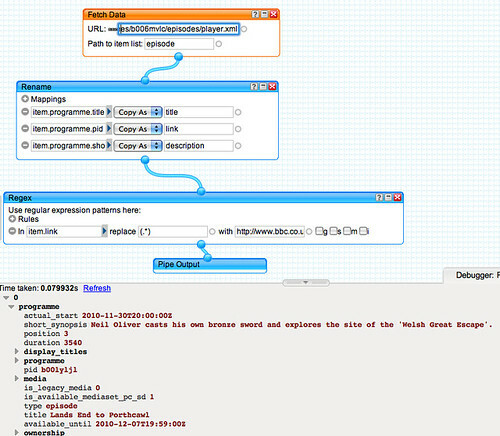 The resulting output is a feed of episodes of Coast currently available. The link can be easily rewritten from a programme page form (e.g. 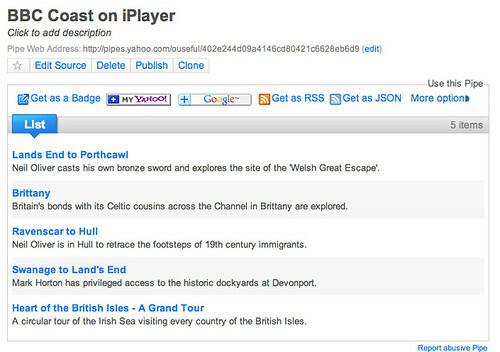 http://www.bbc.co.uk/programmes/b00lyljl) so that it points to the iPlayer page for the episode (e.g. http://www.bbc.co.uk/iplayer/episode/b00lyljl). If the programme is not available on iPlayer, I think the iPlayer link redirects to the programme page? This extended pipe will accept a BBC series code, look for current episodes on iPlayer, and then link to the appropriate iPlayer page. 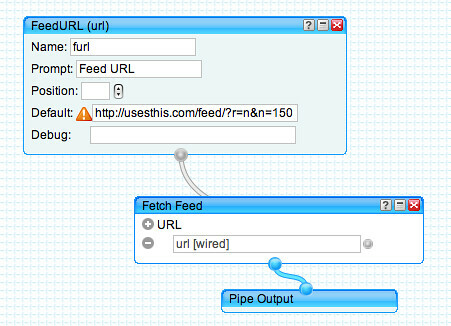 Subscribing to the RSS output of the pipe should work in the Boxee RSS app. You should also be able to compile a standalone Python runnable version of the Pipe using Pipe2Py. To recap – given a programme page identifier (in this case for a series), we can get a list of clips associated with the series; for each clip, we can then pull in the data version of the clip’s programme page. Which is to say: grab a feed from delicious, extract programmme/series IDs, lookup clips for each series from the programme page for the series, then for each clip, lookup clip details from the clip’s programme page. And if the dependence on Yahoo Pipes is too much for you, there’s always pipe2py, which can compile it to a Python equivalent. PS hmm, as well as the piPE2py approach, maybe I should set up a scraperwiki page to do a daily scrape? PPS see also Visualising OU Academic Participation with the BBC’s “In Our Time”, which maybe provides an opportunity for a playback channel component relating to broadcast material featuring OU academics? 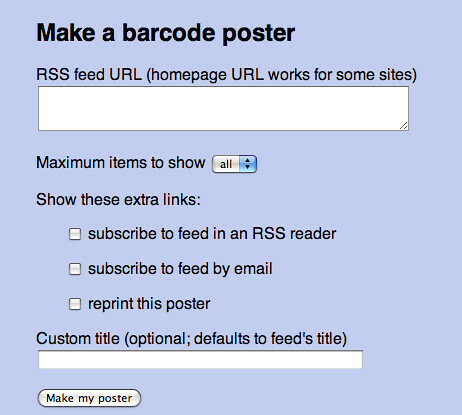 Skimming through my feeds a few minutes ago, I saw a post by Karen Coombs on the OCLC Developer blog about QR Code hacks to “mass generate QR Codes for all the web addresses of the applications in the [OCLC] Application Gallery”. 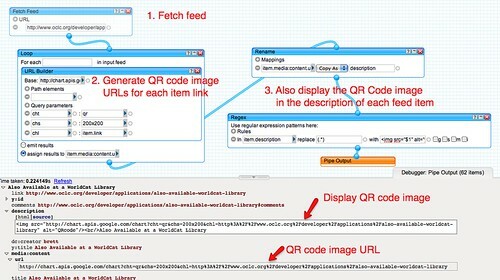 The technique uses a bit of PHP to parse a feed from the gallery and create the QRcode images using the Google charts API. Using the Yahoo pipes image gallery badge, or maybe the Google AJAX Feed API, you can then quickly and easily generate an embed code to display the feed in a gallery widget in your own webpage.